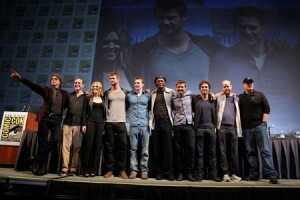 This years comic con has given those lucky enough to go an amazing weekend. It has given us everything the comic geek could have wanted. A Smallville season 10 trailer the first look at Captain America along with a whole lot of Green Lantern movie props. The biggest treat for the fans came in the form of a five minute trailer of Thor which should hopefully hit the net sometime this week. 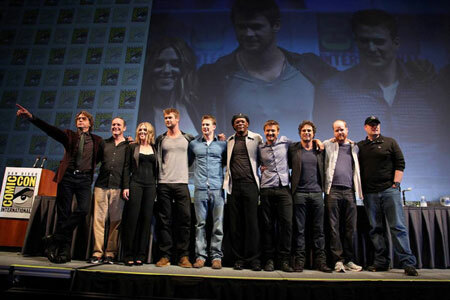 One pretty big event of the weekend was when the cast of Joss Whedons 2012 Avengers movie got together for a cast shot. This was the first time we have seen the whole lead cast together at the same time and it confirms Mark Ruffalo (Shutter Island) has taken the role of the new Bruce Banner and Hawkeye has been cast as Jeremy Renner. Nobody has officially confirmed why Edward Norton hasn’t signed up for the role but it it likely to be due to the Hulk having a much smaller part in the Avengers movie and too small a part for Norton to jump on board.